The New York Times Attacks Lone Star Tea Party, Adryana Boyne Responds! I had specifically come to this rally because it was supposed to be especially diverse. And, on the stage at least, it was. The speakers included a black doctor who bashed Democrats for crying racism, a Hispanic immigrant who said that she had never received a single government entitlement and a Vietnamese immigrant who said that the Tea Party leader was God. It felt like a bizarre spoof of a 1980s Benetton ad. Mr. Blow, you infiltrated a Tea Party event in Grand Prairie, TX on behalf of your paper. It seems like you were not there to listen to the real message of the speakers’ speeches or to judge the content of the audience’s character. Your main intention of being there is because you are an African American who wanted to prove that there is racism in the Tea Party movement. Thursday night I saw a political minstrel show devised for the entertainment of those on the rim of obliviousness and for those engaged in the subterfuge of intolerance. Mr. Blow, what is your problem? Are you underestimating thousands of Hispanics in this country, implying that we cannot think for ourselves or make our own choices to working hard and take fiscal and personal responsibility? Are you underestimating thousands of Asian Americans and African Americans? You are the one who has sentiments of bigotry sir! Who in the world do you think you are? You did not even bother to interview any of the 18,000 people who were there and let them share why they had decided to attend. I can only speak for myself, but you really seem to have the intent on doing a racial head count of the crowd. Mr. Blow, first of all as you "counted" minorities that evening let me tell you that there is no way that you can know how many of Latinos were there. Firstly, because there were 18,000 of us and secondly, because Latinos/Hispanics come in all types of colors, shapes, and forms. Some are white, some are brown, some are Asians, some are black, some are short, some are tall, some are chubby and some skinny, some have blue eyes, some have brown eyes, some Hispanics speak with accents, some do not. So you do not have any idea how many Hispanics were there. Since we are in Texas, you probably should know that many people here in Texas are Hispanics and we do not look alike! The Tea Party organizers did not tell the guest speakers what to say in our speeches. They invited us to speak, as they were fully aware that we would share the sentiment of being fed up with the government: Taxed Enough Already! That is the message! They just invite those speakers who agree in the message of personal and fiscal responsibility and who understand the issues. They invite intelligent people to speak. Americans from different backgrounds. Speakers are from different political parties. We are not here to promote our particular party but conservatism. As for me, I am a Republican because I believe it is the party of the conservative social and fiscal values. What I shared is so much more than the line that you mentioned about me in your article. I am a proud American citizen, and I believe the government should give accountability to the people, not people to the government. For your information this is not the first time I spoke at a Tea Party event. 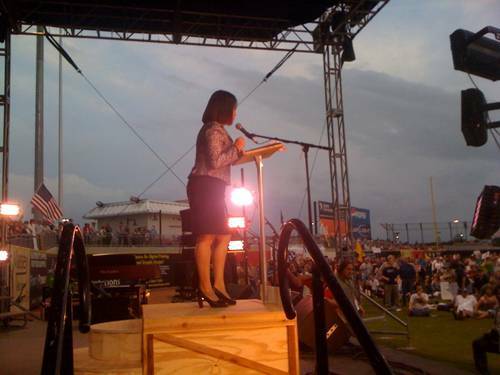 I spoke last year on the 4th of July in South Fork Ranch to 35,000 people! And that was long before Keith Olbermann's comments. The Tea party has had American speakers from all races and colors since the very beginning. It's just people like you who seem to make a big deal of it. You are lowering your journalistic standard by slandering people you do not even know. I speak my values. You may not agree with them. But you should at least respect us. In your article you are trying to imply that we were insincere as we spoke. You are wrong sir. I was more than sincere. The other speakers were also sincere. We desire to educate others why we vote for candidates who stand for our rights to life, liberty and the pursuit of happiness. I was there because I believe my message was important to all Americans. Because I love America. As a Christian and as an American I believe I have the freedom to speak what is in my heart to help others understand the values that I hold dear and the fact that America has embraced me and I have embraced America. And I am that Hispanic who has never received a single entitlement from the Government!